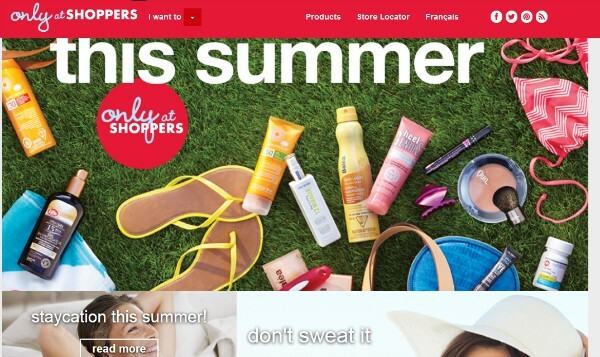 Shoppers Drug Mart has just launched a brand new lifestyle digital platform called Only at Shoppers. It’s the first of its kind for Shoppers and has lots of fun information related to summer health, beauty, organization and more. I spent an hour this past weekend checking out the site and I think you’ll enjoy it too! Find the content that interests you by selecting a category in the dropdown list when you first go on the site. Do you want to “Live Healthier”, “Feel Rejuvenated”, “Look Beautiful” or “Be Organized”? After you select the topic, you’ll then see related blog articles, quizzes, polls, videos, coupons and more! In “Look Beautiful”, I learned how to create a Summer smoky eye, 4 common skin problems with suggestions for products that can help and whether it’s best to wax or shave. I tested my knowledge of SPF in their poll and got the answer right! Only at Shoppers is an excellent resource for tips and inspiration to get ready for an awesome summer. Go check it out! I liked that they have tips and ‘directions’ for a At Home Spa Day! The whole Quo line! Love it! I like their Shopper’s Optimum Club! I like the info they gve you. Would love to spring clean! I loved their Cottage Etiquette article. Very Canadian, eh. I like the loyalty rewards program. Thank you! What a great selection of essentials that we all can use all year long!! I adore the Quo makeup line! It’s so stylish and priced reasonably too! I like their Life products. I going to try the Vegan Mashed Cauliflower. Bodylogix vegan protein all natural plant based protein! CC Powder evens out skin tone, blurs imperfections and visibly brightens your skin. “Short Hairstyling Tips” because I just had all my hair chopped off for summer. I liked the article, “Road Trip Essentials”. I like all of the articles on health, makeup, etc. I liked the article on the 411 of spf. I liked the articles on health, makeup, & other subjects. I love the video on Packing Like a Pro. I knew there had to be a better way than I do it.